This photo was taken on February 13 at 3:45 AM. The location was outside the entrance to a 7/11 in Bethesda Maryland. The "Take It!" came from the completely unexpected encounter with an act of nature. We were under a High Wind Advisory, which was measured in gusts up to 60mph. It was enough to shake my car at some intersections as I waited for lights to change. I arrived at the 7/11 that I frequent in my town and stepped out with a finger being held to my hat to keep it from blowing away. 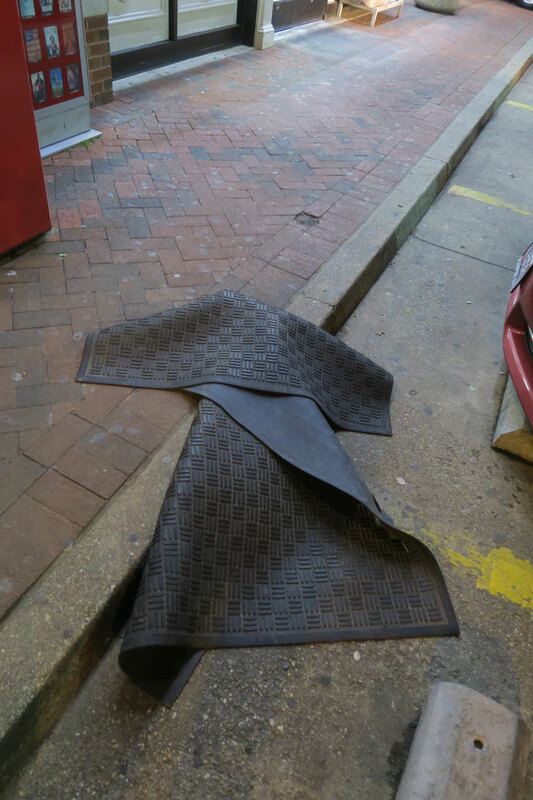 On my way in, I stepped over the rubber mat that is usually in front of the door as it had been upended by the wind. I barely took note of it. On my way out, I happened to look down at the mat and saw the amazing set of folds that it had accumulated in the wind storm. There was as if carefully folded by hand - a what appeared to me to be the likeness of a Samurai Jacket. That it is ever so randomly draped over the curb gives this photo that much more impact. The After Take: I showed this to many as a follow up during the day. All joined me in the surprise of the likeness to the infamous jacket. Some even envisioned a person being wrapped up in it, which was fun to hear such additional stretching of imaginations. Here is hoping this strikes your wonder button as strongly as it did mine. My buddy who works on this site, Taylor, told me I had to check this one out. He knows I'm an ancient Japanese buff. This is just too funny! I had to google this one because I'm not familiar with what Samurai wore, but after seeing their outfit it definitely works lol. Boy I bet they wish they had rubber lining on them back then. One of our daughters said it looks like an arrow pointing to the store. We got a good laugh from this, I can see the resemblance to a Samurai.